New Course Package due out within 2 weeks. As I mentioned in a previous blog post, I will soon be retiring many of the courses in the video store. … For those who still need say the Dreamweaver CS6 course, it will be there, but generally pushed to the background. At the same time, there are other courses that are just going to be replaced altogether. I would say that the biggest change will be the format in which we provide training. Rather than download to own, we will be offering lifetime streaming access to the new content. It seems to be how people want it. In other news, I will be introducing a new style of style of training; something I call ‘immersive interactive’ training. I built my first video course in about 2003, and have been retiring courses over the years as needed. Now that time has come again, where within the next few months, I will be retiring all of the older courses from the site. … In fact, I plan to stop selling the vast majority. Yes, some still want to learn Dreamweaver CS3, CS5 and CS6 but their time has passed and so should the courses. … These are easily my best courses yet. Expect to see the new courses to hit the store in October 2015. My new book is on Amazon! 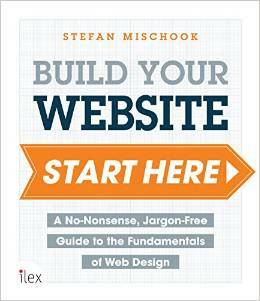 My new beginners book on web design will released June or July in 2015. You can pre order it now on Amazon. It should also be in bookstores in the UK and the US at the same time. … And I have a Facebook account etc. If you are interested, probably best to catch me on twitter and my blogs. We have a huge Dreamweaver CS6 course (10 hrs of videos!) but these days, it can be hard to find a trial of Dreamweaver CS6. Adobe wants you to get into their cloud version of Dreamweaver – Dreamweaver CC. In our Dreamweaver CS6 course, you learn much, much more than Dreamweaver … it’s really a beginners web design course. It’s also very designer centric … you build great looking websites in this course. That said, it’s hard to learn without Dreamweaver CS6 … though the latest Dreamweaver CC is very similar, there are still differences that might trip up a beginner. So the solution is to download the trial of the new Dreamweaver CC and deal with the differences, or you could buy an older copy of Dreamweaver CS6 – be sure it’s legal! I just downloaded it today (April 17th 2015) … so you should be good. Why bother? There just a lot of great stuff in the Dreamweaver CS6 course and some people rather just own Dreamweaver CS6 and not rent Dreamweaver CC. Then again, you don’t need Dreamweaver to build great sites. Photoshop is powerful, but it’s overkill for 99% of web developers/designer needs. It’s not expensive at $9.99/month for individuals, and $19.99/month for business use. But over a few years, this could add up! The key point is that most web professionals need maybe 10% of Photoshop’s power – if that much. There are easier to learn, very capable cheaper alternatives. A few free ones too! Paint.net – Windows only. But free! The Gimp – Strange name but powerful and free! Runs on Mac and Windows. Xara Photo and Graphic Designer – Not free, but you can buy it for $89.99. I use this all the time. It’s bloody fast! … And there are others. The point is, there is more to Photoshop in the image editing world. I’ve decided to now back all my courses you buy from Killervideostore.com, with a 30 day money back guarantee. If for any reason the course doesn’t work for you, just shoot me an email and I will refund you. Hmmm …. that means you have nothing left to loose! Start learning today! New Video Store Skin is Live! Finally, after a few years of complacency, we’ve updated the video store! I hope you like the new look! There might be a few bugs here and there, given how big a change we made, but it should all be resolved and tip-top in a few days. New courses coming out soon too. I’ve been teaching web development for over tens years now, and things have changed a lot in that time. Besides web development itself, the WAY people want to learn has also changed. The first thing that I’ve done to respond to these changes, is to provide a far more advanced subscription based training service: webmentor.org. Those of you familiar with the old Killersites Library, will appreciate the upgrade you find on Webmentor.org. Whichever format you choose, you will have LIFETIME DOWNLOAD ACCESS to the courses you buy. So if (for example,) you loose them a year from now, you will be free to come back and download them all again. How to Become a Web Developer – the Video! The following details the steps you need to take to become a web developer – this is a question I get all the time by the way … you are not alone! To be clear, you don’t need to master all these before you get to step #2, #3 and so on … But you do need to see these as the ultimate goal. … In fact, you could quickly move into step #2 once you have a good understanding of CSS and HTML under your belt. As you learn more though, you will be able to take on more jobs (simply because of the greater variety of skills you will have) and raise your pay/salary as you become more valuable and more experienced. If you want to read the rest, it’s in this PDF.